Custom tote bags are one of the top-selling promotional products and are the perfect solution every, promotional and marketing need. We have a large selection of styles and colors for you to choose from! This promotional tool is something your organization and your clients can actually put to use. No matter if they are used while shopping for groceries, lounging at the beach or while out and about, your company or organization’s logo or message will be on display for all to see. Reusable bags are in high demand and with more and more cities eliminating plastic bags, that demand will only grow. Don’t over look one of the most sought-after giveaways for trade shows or corporate events, employee appreciation gifts, or any type of marketing merchandise. They make wonderful corporate giveaways, or work conference retreat items as an essential branding tool for your company. As far as promotional items go, this merchandise is one of the best there is. It can be ordered in bulk giving you the lowest wholesale price, allowing you to always have a quantity on hand to give away. Show your customers, clients or employees your appreciation with this custom promotional item, which also allows them to be environmentally sensitive, while advertising your brand far beyond any venue that you may have considered. First, you will want to determine the color of the bag and be certain that it doesn’t compete with the colors in your logo or the text. Colors that are the similar can reduce the overall impact of your design by making the graphic and text less visible. We recommend trying to use colors that contrast with each other. Complimentary colors provide a visible punch that really stands out. Red and Green, Blue and Orange, Purple and Yellow are the primary and secondary complimentary colors. Tertiary complimentary colors are Magenta and Yellow-Green, Red-Orange and Teal (Blue-Green), Violet (Blue-Purple) and Yellow-Orange. Second, consider how you intend the bag to be used so that you can choose what material the bag should be made of. 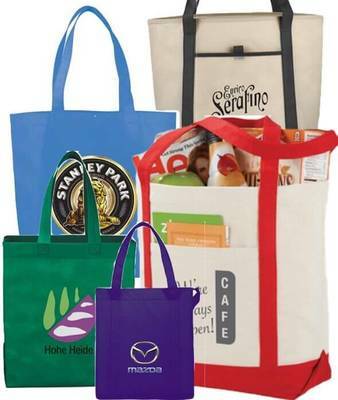 If you think it will be used as a grocery or shopping bag, you will want to invest a little more and choose a durable material. Non-woven, laminated non-woven or cotton canvas are good choices for this use. Keep in mind, that any bag that is used for groceries or fresh food should be washable so that they don’t collect and spread bacteria to the food. A bag that is intended to be used as a gift bag or for casual use, can be made from a lighter material. Clear plastic, heat-sealed non-woven polypropylene, or light polyester are some excellent options. As always PromotionChoice is here to answer any questions you may have when ordering your personalized tote bags. Look through our wide selection of styles, colors and materials and get your order started today!